Leah Hogsten | The Salt Lake Tribune l-r Brighton graduate Marcela Morales, Copper Hills senior Daud Mumin, Highland senior Chase Harward and Brighton graduate Olivia Fletcher listen as the Utah Safe Schools Commission gives recommendations for improving campus safety, Wednesday, June 20, 2018, at the Utah Capitol. A group of Utahns convened to review school and student safety recommended Wednesday that lawmakers approve a so-called “red flag” bill, allowing weapons to be seized through court order. Rep. Ray Ward, R-Bountiful, said current law allows for confiscation of weapons if a specific threat is made against specific people. But the law falls short in situations where a gun owner is believed to be a danger to the general public. “We have a gap if a person is making general threats against the community as a whole,” said Ward, who facilitated meetings of the Utah Safe Schools Commission. Ward referred to a bill being prepared by Rep. Stephen Handy, R-Layton, which would create a new category of “extreme risk protective orders.” Handy sponsored similar legislation in March, with the support of House Speaker Greg Hughes, R-Draper, but which failed to gain traction among lawmakers in the final days of the 2018 session. Hughes, who is not seeking re-election this year, said Wednesday that he was overly optimistic about Handy’s bill in March, and now appreciates the time and debate necessary for action on gun ownership and school safety. Hughes continued to support the creation of the new protective orders on Wednesday, saying that bill and the safety commission’s other top priorities have a reasonable chance of success. “I’d like to see that happen sooner than later,” he said. The Utah Safe Schools Commission issued a report with three tiers of suggested steps to protect students. The top tier, representing ideas with “strong consensus among the commission,” included the adoption of gun violence restraining orders, as well as the development of school threat-assessment teams — composed of administrators, mental health practitioners and law enforcement representatives — and the improvement of Utah’s mental-health reporting for federal background check databases. 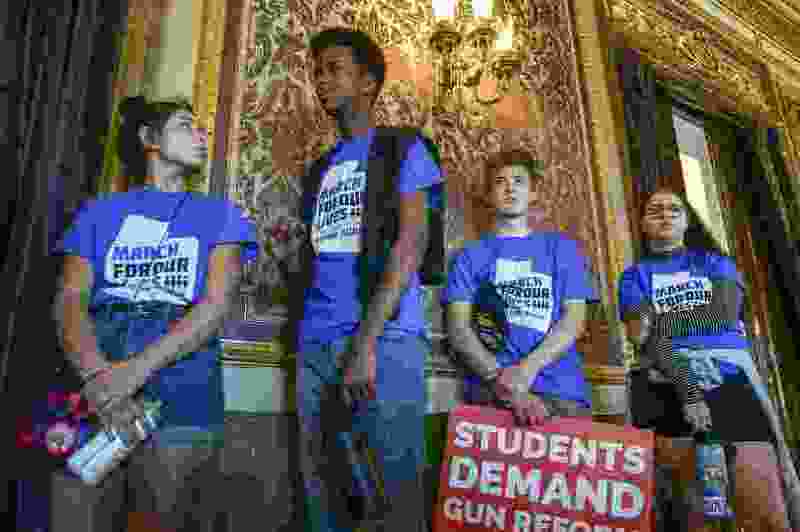 Lower-tier recommendations, with majority or minority support of commission members, included the use of panic-alert systems or apps by educators, universal background checks and waiting periods for firearm purchases, penalties for unsafe storage of firearms and strict control of access to schools. The commission included Clark Aposhian, a gun-rights advocate and chairman of the Utah Shooting Sports Council; Dallas Earnshaw, superintendent of the Utah State Hospital; Brigham Young University sociology professor John Hoffmann; Keith Squires, commissioner for the Utah Department of Public Safety; Bryan Turner, an architect with Davis School District; Utah Education Association President Heidi Matthews; and Terryl Warner, a member of the Utah Board of Education. Two student members, Elizabeth Love and Isaac Reese, also joined the commission. Love and Reese were involved in organizing the March for Our Lives, which saw thousands of Utahns — mostly high school students — march to the Utah Capitol in support of gun-control legislation. Love said she was “pleasantly surprised” to see priorities of the student-led demonstrations embraced by members of the Safe Schools Commission. “A lot of the adults were really invested in our voices being heard,” she said. Rep. Mike Kennedy, R-Alpine, convened the Safe Schools Commission as its original facilitator, but transferred that role to Ward after launching a campaign for U.S. Senate. On Wednesday, Kennedy said he appreciated the hard work of the panel’s volunteer members. “I firmly believe that bringing people with different viewpoints to the table to discuss options will benefit us all,” Kennedy said. But Randall Doyle, a board member for the Utah Shooting Sports Council, questioned the commission’s focus on mental health and protective orders in lieu of increased security on school campuses. Schools need to be “hardened,” Doyle said, similar to the way banks and other entities protect their assets with armed guards and strictly controlled entry. “The proven way of keeping firearms out of schools is for the bad guys to know they’re going to encounter force,” Doyle said. Gun violence makes up a small fraction of school-safety concerns, Doyle said, compared to more common instances of bullying and assault among student peers. Ward emphasized that as an ad hoc commission, the school safety panel lacks authority to launch legislation or appropriate funding. He said the conversation will now turn to lawmakers to determine whether to implement the commission’s recommendations, and in what form. Hughes said the second- and third-tier recommendations, like waiting periods and universal background checks, are harder to move through the legislative process. But he added that modern technology may allow for reasonable background checks and purchasing systems that can be used by private sellers. “I would definitely think that’s worthy of our serious consideration,” Hughes said. In a prepared statement, Gov. Gary Herbert’s spokesman Paul Edwards said he is grateful for the efforts of the commission to identify common-sense measures that state leaders can consider.